Hi friends! 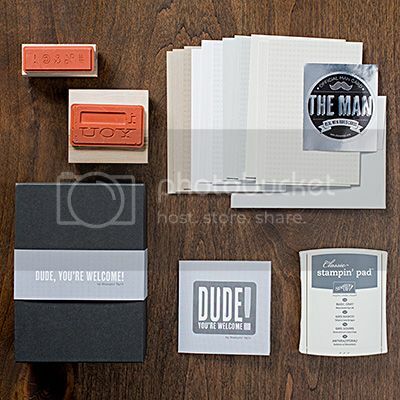 Today I'm sharing with a Thank You card that features the Dude, You're Welcome Kit. 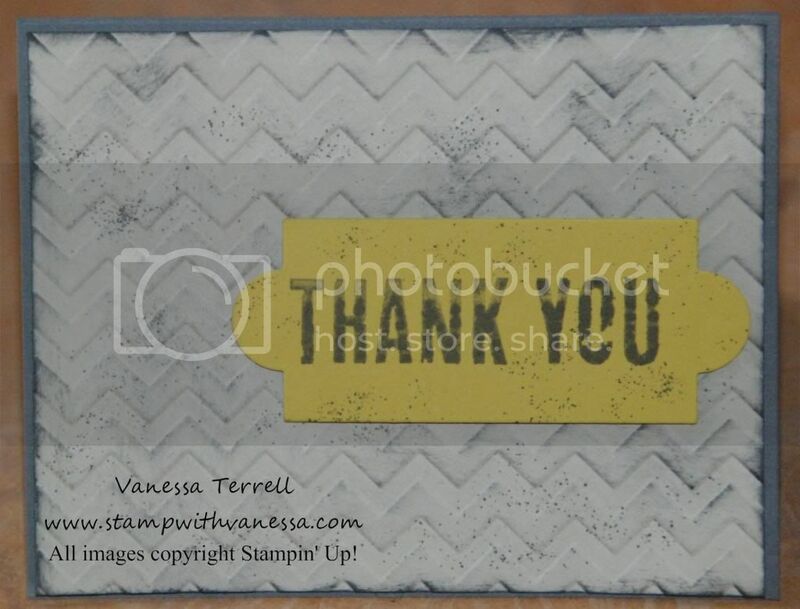 This kit was just recently introduced from Stampin' Up! I am really liking this kit! Why am I liking it? I'm glad you asked! I like the kit because the four stamps come assembled (double-sided), the images are bold, it's a kit that a guy could use with instructions. But I found this kit to have so much more potential, granted so far I only made 1 card with it, but I can see myself really using it for other projects because of the bold images. Here is what the kit looks like. I made a Thank you card and wanted to keep it simple not to take away from the image! So here is my card, I did stamp the image on my favorite color Summer Starfruit to give it some pop! I used pretty neutral colors except for the Summer Starfruit and used the Chevron Folder and the Apothecary Accents Framelits for the Thank You. I also sponged and spritzed on some ink for more texture. I'm liking this kit and look forward to using it again! Gosh--do you know any guys who stamp? I'm wondering whether the makers of the kit are hoping to get more men interested in the craft. Mary as a matter of fact I do and I do it very well! You would be surprised! Thanks for stopping by! Nice and easy to use and easy to understand. Thanks Vanessa. Sue, thanks for stopping by! Very cute card Vanessa and I love the embossed pattern in the background and the yellow really makes it pop.